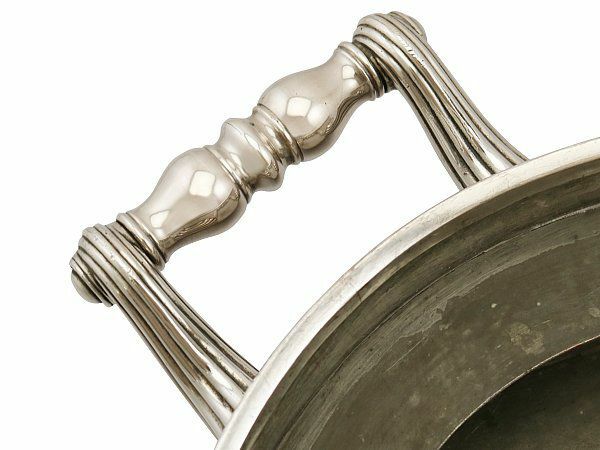 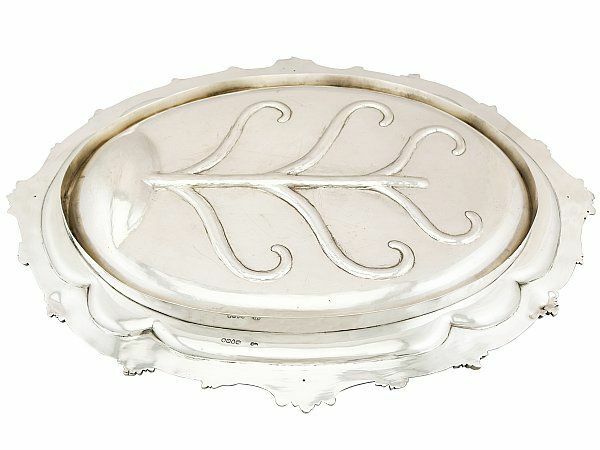 This exceptional antique Victorian sterling silver and Sheffield plate venison dish has an oval shaped form onto four impressive volute scroll feet. 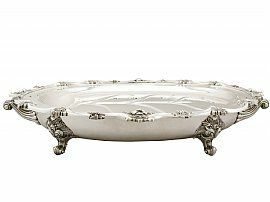 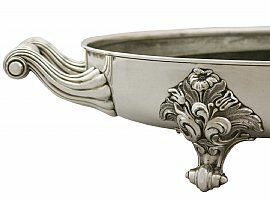 The shaped rim of this large silver dish is accented with impressive applied floral and stylised leaf motifs. 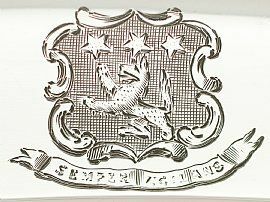 One side of the broad raised border is embellished with a bright cut engraved scroll bordered crest* of a wolf rampant with three mullets fesseways above the motto 'Semper Vigilans' - Always Vigilant. 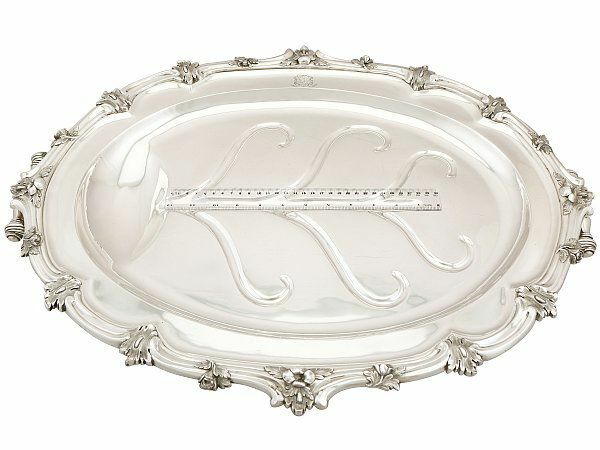 As with porcelain examples, the central dish of this meat platter has embossed gravy draining channels to a plain well at one end. 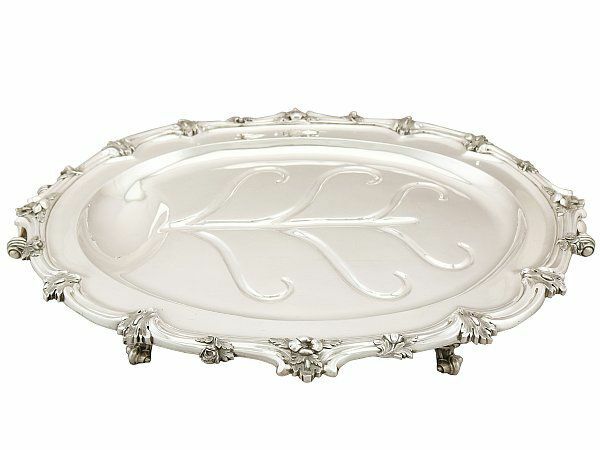 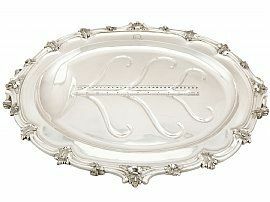 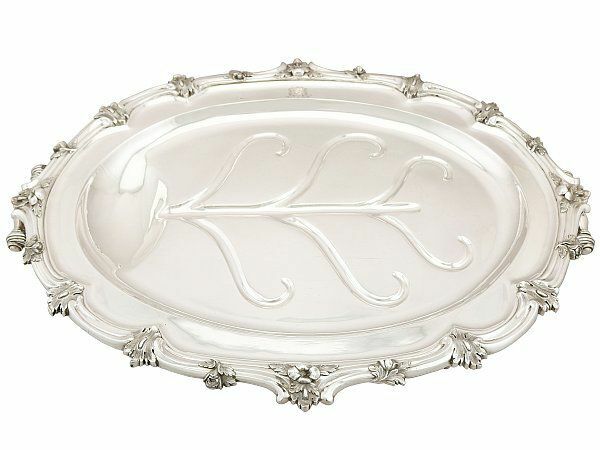 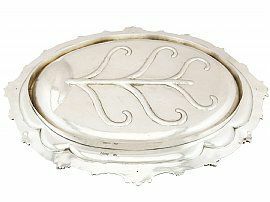 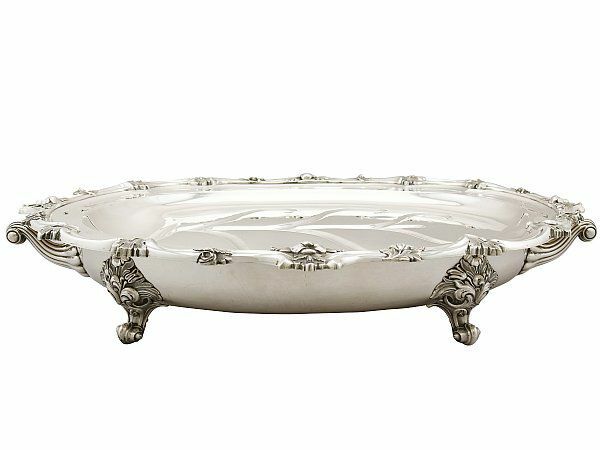 The sterling silver platter has an applied rim to the underside to enable a secure push fit to the Sheffield plate base; the combination of sterling silver and silver plated components was/is normal practice for this style of dish. The dish is fitted with two shaped double baluster style carrying handles with fluted decorated shaped arms and sockets. This antique piece is fitted with four volute scrolling feet embellished with impressive scrolling leaf decoration accented with stylised floral designs. 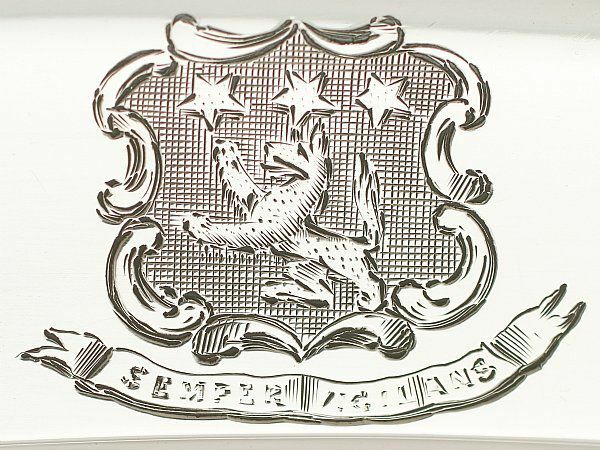 * These heraldic markings pertain to the Wilson family. 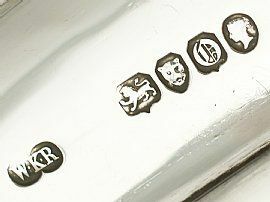 Read this items heraldic identification report. There are fine knife marks to the surface of the platter, but this is to be expected in keeping with age and does not detract from the aesthetically pleasing appearance of the piece. 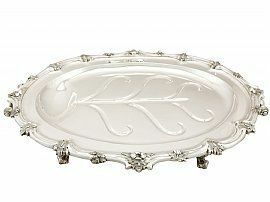 The nature of the push fit platter has effected minor surface wear to each handle. 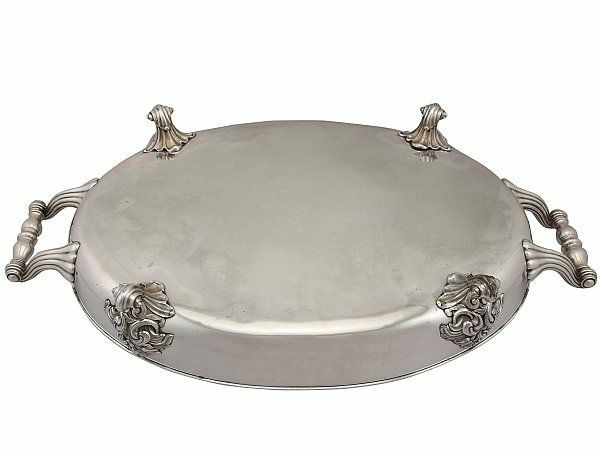 There are a few dings to the underside of the platter and the Sheffield plate base has some bruising to the underside and surface blemishes in keeping with age. 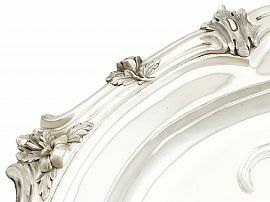 When the components are assembled for use the blemishes and dings are not visible. 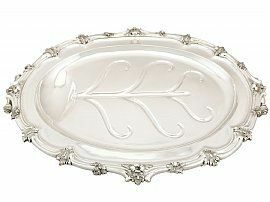 The applied decorated border to the platter is sharp. The bright cut engraved crest is crisp. 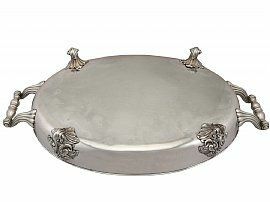 Full hallmarks struck to the underside of the silver platter are very clear; the Sheffield plate base is unhallmarked. 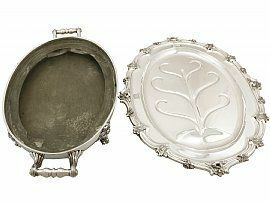 The wear to these pieces is to be expected with age and function, and does not detract from the overall appearance. 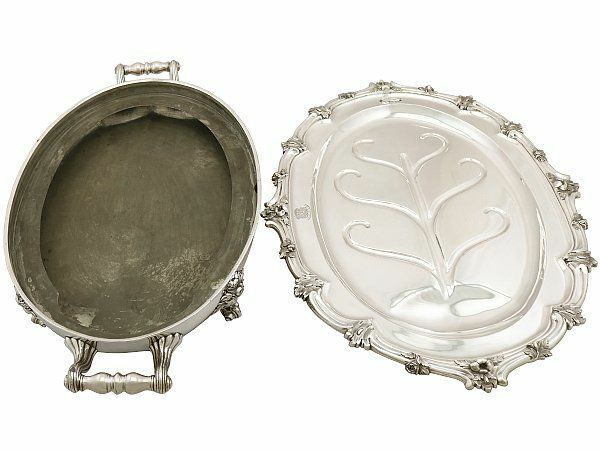 Such a combination of platter and dish is rare to the market, and is therefore worthy of inclusion in the AC Silver inventory.